Where to buy a kids’ electric 4 wheeler? How to charge a little kid’s 4 wheeler? How old to start kids on a 4 wheeler? As Christmas or birthdays come closer – many kids start making wish lists and express what they would want to receive as a gift. For many kids, 4 wheelers are a dream present that tops the list, and that might have topped the list for years, so why not consider making them happy by providing them with something you can enjoy together? A 50cc four wheeler isn’t only fun for the kid, but could actually be an excuse for you as a parent to spend more quality time with your little ones. Children should always be supervised when riding a 50 CC ATV, which most understand perfectly, and that will give parents a moment to spend with their rebellious pre-teens without them objecting. For growing children, four wheeler bikes can teach both responsibility and independence, while also being a fun ride on toy to play around with that encourages outdoor play. Looking for more of a challenge? Try an electric trike for kids. These four wheelers for kids looks just like real ATVs! It has a twist-grip throttle that can get it into motion fast and effortless, and it drives at two different set speeds – 3 and 6 miles per hour. This youth 4 wheeler has high-speed lock-out (parent controlled) which makes it a great option for beginners and younger children. The monster traction allows this ATV for kids to drive safely on anything from wet grass, to mud and gravel, hard surfaces and other tough terrains, and it has a power lock brake system that puts the miniature vehicle to a quick halt when needed. 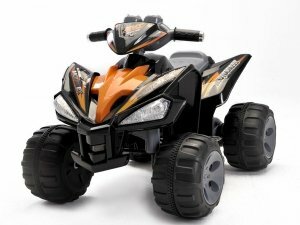 Why We Liked It – Children will love these youth four wheelers, since they look just like the real thing, and can drive on most surfaces, including difficult terrain. 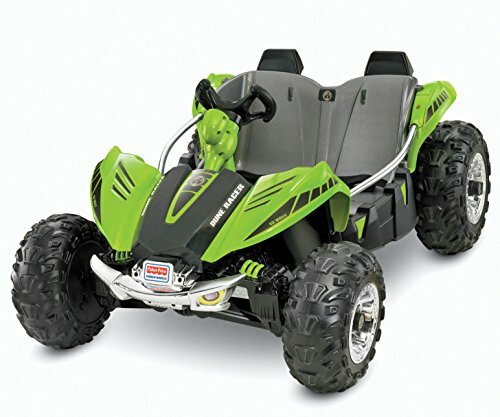 A fancy looking 4 wheeler for 8-year-old children and those younger (age recommendations are children 3-8) that will set the foundation for many fun outdoor days! 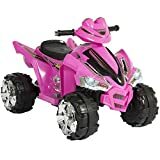 These funky and pink 4 wheelers are fun to ride, safe for very young kids, it has a 500W motor and a 36V battery and it is equipped with three different speeds a well as the option to reverse. It has a top speed of 13mph, takes about 6-hour to charge and it is built for children weighing up to 40lbs. For kids, four-wheelers can be a fun way to spend time with a parent, a chance to learn to operate a moving vehicle and a good lesson in responsibility. The durability of this product is developed with a rough child’s play in mind, and the manufacturer has all the parts in store if an accident should happen, or if something needs to be replaced. Why We Liked It – Pink is for cool kids, and these 4 wheelers for kids that want to stand out is both easy to drive, powerful and great looking. It is the perfect combination of attributes for a younger child and will keep them entertained for hours. Even the youngest in the family deserves a shot at driving around on a 4 wheeler for kids, and this kids quad is the perfect item for any toddler who wants to start out early. It starts and stops with a simple push of a large button, and the max speed is 3mph – safe for any young child to use. It should not be used by children weighing over 40lbs but will offer a safe and comfortable ride for any lighter individual. 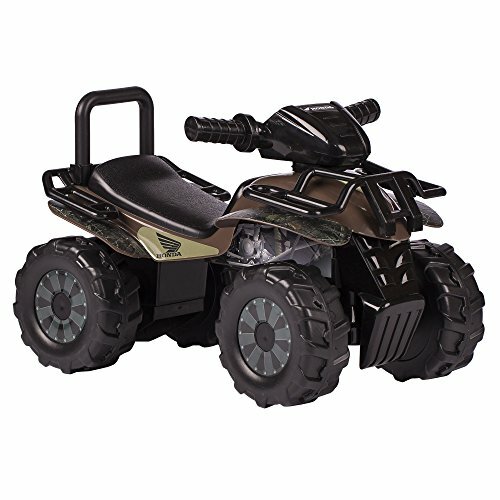 It is a youth ATV for sale in select stores and online, and the slow driving speed makes it appropriate for small toddlers to roam around on either inside or outside on hard surfaces and grass. Why We Liked It – These children-friendly four wheelers are for the absolute youngest riders, and since they only drive 3mph – they make fun quads for toddlers and kids that want to be like their older siblings and/or parents. What kid wouldn’t want a youth ATV to roam around on in the backyard? This sturdy 50cc 4 wheeler has durable rubber tires that will take an adventurous kid over pretty much any obstacle in average terrain. The powerful motor allows the child to drive with a maximum speed of 13mph, and it is suitable for children aged 3 to 8. 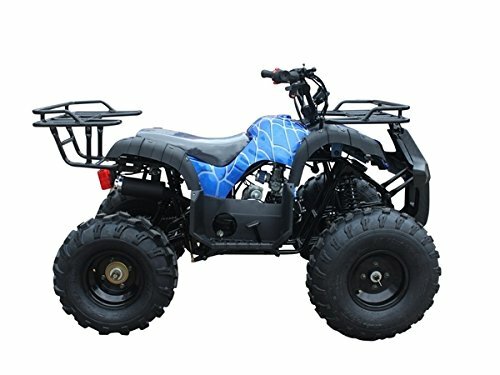 The weight limit is higher than on many similar products, and this sleek and fancy looking 50cc ATV will carry children weighing up to 90lbs. 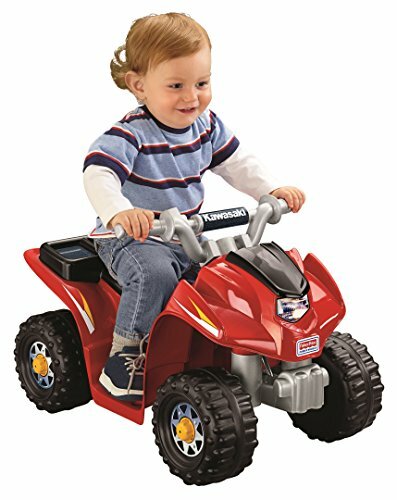 The 3-speed governor and the disc-break system ensure a safe and pleasant ride for an adventure-loving child, and these small 4 wheelers can be used without problems on asphalt (remember to always supervise a child riding close to roads or trafficked streets), grass, dirt roads and more, and it is a great option for a kid ATV for a first-time user. 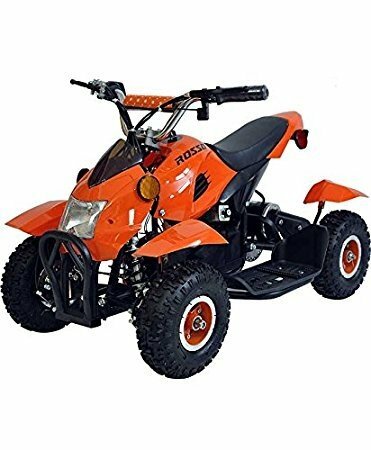 Why We Like It – The discrete yet gorgeous orange color will fit the taste of most fun-loving kids, making these children-friendly 4 wheelers the perfect gift for any youngster with a passion for ATVs. It is easy to use, light enough for a child to manage and built to last for a very long time. These electric off-road children’s four-wheeler bikes have powerful batteries with fairly fast charging time – they are high-quality four wheelers for 8-year-olds and older children that gives the buyer his or her money’s worth. The hand-operated rear disc brake of the Razor Dirt Quad bike adds extra safety to the driving experience, and it can support a weight of up to 120lbs. Many ATVs for kids are made for younger children, which makes this four wheeler for kids a strong contender for families with pre-teens and teenagers, as a final step before they are ready for real four wheelers for kids that are closing in on adulthood. The design and the color scheme are sleek and classy – black with red details – and these come with 2 included 12V batteries. 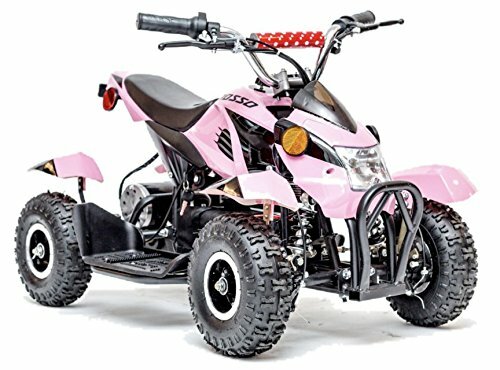 Why We Like It – For restless and challenge-loving kids 4 wheeler bikes can be a great way to experience independence and to get to feel like they can manage something on their own, and this sturdy product is perfect for older kids and teenagers that are not yet old enough to drive a real ATV. he same time, since it has two comfortable racer seats, designed for a driver and a passenger. It has metal sidebars to keep the child securely inside the vehicle, and also providing them with somewhere to place their hands for support and maximal comfort. Whether you are looking for four-wheelers for 10-year-olds, a suitable 4 wheeler for 6-year-old children or grandkids, or perhaps the best youth ATV – this is a product worth considering. It is versatile, durable, strong enough to hold a bigger kid and it prevents sibling disagreements since two small people can use it at the same time. No need to fight. The low top speed (2.5mph and 5mph) makes it more appealing to young children and toddlers, and an older child might prefer a faster model. Why We Like It – Not all siblings fight, but many do, and for parents with fight-loving kids – a dual-seated product such as this one can be a way to prevent endless fights over whose turn it is to ride. The Blue Spyder is a kids 4 wheeler that is sure to catch the eye of any by-passing neighbor or neighborhood kid. It is a tough all-terrain vehicle that is suitable for responsible children, and it comes with several safety features. There is remote parental shut-off control, which means you can kill the engine if needed while your child is riding it. There is also a shut-off plug with a cord that attaches with a clip to the child’s clothing, something that will shut the engine right off if the child would happen to fall. It is a kids ATV that works well on most surfaces; such as gravel, dirt roads, grass (including wet grass) and asphalt. Why We Like It – When choosing presents for children four-wheelers can be that dream gift they will remember as long as they live, and this all-around option is great for both younger drivers (since it comes with parental control and adjustable top speed) and those a bit older, and the price is affordable when compared to other similar products. Here we have a 4 wheeler for 3-year-old toddlers and those even younger (recommended age 12 months to 3 years), that looks surprisingly realistic! Toddlers will love having their own children four-wheelers to drive around on. It has light-up dash buttons that when pushed will play songs, phrases, and other fun sounds, making it appealing even for the youngest of Quad 50 lovers. It has front- and rear racks for safety, and thick reliable tires for a comfortable ride even on bumpy roads. The volume of the sounds is adjustable so that every parent can pick one that better fits their home environment. Why We Like It – These mini ATVs for kids aged 12 months to 3 years is a fun and safe way to get around the backyard, and the sounds and music will keep them entertained for hours! 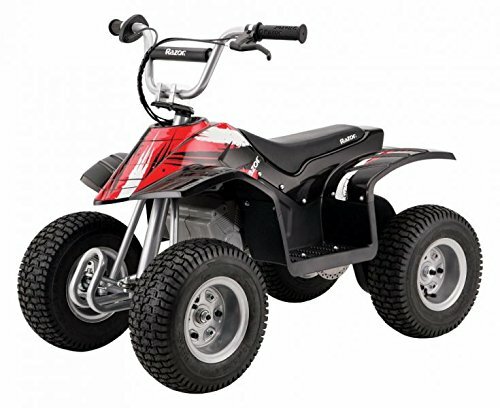 With 2mph and 4mph speed options, these kids ATVs are suitable for children 24 months old and up. Both rear wheels have excellent power and traction, it is easy to control, and it has a weight capacity of 66lbs. Batteries and charger come with the product so that you can get your child on it right away after the initial charge, and one charge will last long enough for a fun play session that will leave the user both tired and happy. These kids quads are made with high-quality materials, apt for use by toddlers and children under adult supervision. Why We Like It – Small children get bored easily, and this is a great toy for vehicle loving toddlers! As long as they are more 24 months old but weighs less than 66lbs – they are ready to climb on and give it a try! It is almost guaranteed that they will love it. 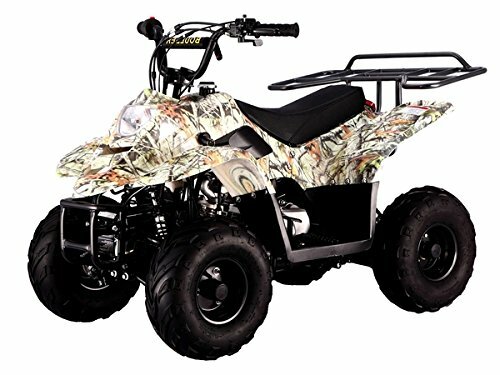 Have your children roam around on this camouflage super children’s quad – more powerful than regular kids ATV 50cc bikes – and see those rewarding smiles as they climb on for the first time. Driving a kid quad is both fun, exciting, and easy to learn, but it can also be great for a child’s motor skills! This product comes with a choice of color, and it has a remote control which allows a parent to regulate the speed and/or to switch off the engine if needed. The engine is air-cooled, and it is powerful enough to be driven on dirt roads, hard materials, grass and gravel, and even in though terrain with twigs and sticks. Why We Like It – It is easy to use, drives smoothly, has a remote control for a parent to kill the engine if needed and much more! Worth its price and durable. Kids today spend a lot of time in front of laptops, touchpads and smartphones; and it can seem close to impossible to get them away from screens and out to play in the backyard. Fresh air and outdoor play are great for children, but how to get them to go out, and to want to stay outside? Getting a 4 wheeler for 10-year-old kids that rather play computer games than play with their siblings outside could be a way to turn the tables! Or perhaps the adults in your family drive ATVs, and you would like to get your toddler started early? There are hundreds of kid quads available, offering options that will suit any family and any situation. There are a few things to take into consideration before purchasing the first children’s four-wheeler for your son or daughter, and below are a few pointers and reminders regarding what to look for, and what to avoid. Make sure you look up age restrictions and weight limitations on the product you plan to buy since children’s four-wheelers are usually made for a specific age group and weight. A 4 wheeler for 11-year-old pre-teens might be more advanced and run faster than a 4 wheeler for 5-year-old’s, and it is also a question of product safety since the ATV you buy needs to be able to support the weight of your child. This is another aspect to pay attention to since you can find four wheelers for 9-year-old’s and up that will go at a speed of 13mph or more, while an electric- or gas powered 4 wheeler for 3-year-old toddlers might only have a top speed of 2-3mph. It is essential to choose a product with a speed your child can handle, to avoid increasing the risk of injury. Some products have ways for a parent to control their child’s new toy ATV; such as a remote control to alter speed or to switch off the engine. This is a great safety feature especially when having younger children, and some products will also have a safety-plug with a string that attaches to the child, and if the child falls off, the string is pulled which instantly turns off the engine. These types of safety features are important for all children, and they should always be supervised when using a toy ATV. Not everyone has access to well-equipped stores, which makes the internet an excellent alternative. 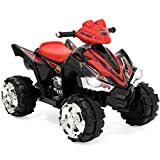 Amazon.com has four-wheelers for kids from hundreds of manufacturers; giving you the chance to compare prices and features, read reviews and make an educated decision. 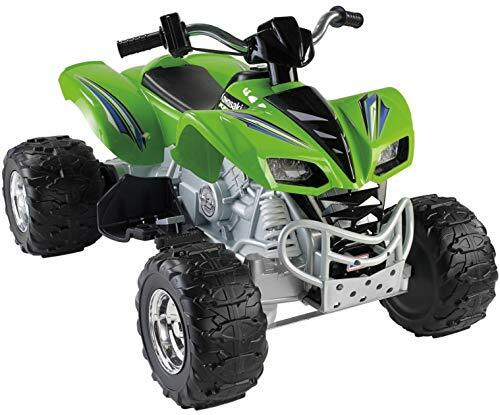 We recommend the ‘Power Wheels Kawasaki KFX’ – a powerful electric 4 wheeler for children, that is likely to live up to all your- and your child’s expectations. A benefit when using an electric four-wheeler is that it is rechargeable, and you can charge it up after a long day of play by plugging it into an electric outlet and leaving it there for a few hours. Chargers and batteries are almost always included (check product specifications if unsure), and most products will charge fully within 5-10 hours. There are 4 wheelers made for children from the age of 12 months, so this depends entirely on what product you choose to purchase. You should always follow the age recommendations on a children’s ATV and get one that is suitable for your child. Think of a product like this as an opportunity to spend time with your child, and to do something together that is fun for the two of you. Choose wisely, taking age recommendations and weight restrictions into consideration, and always supervise your child while they use their four-wheeler. Accidents can happen, no matter how well a child knows to use their toy, so make sure a grown-up is always present. It can be tempting to get your child an ATV that is made for older children, since hey, they’ll grow into it! Don’t do this, since age recommendations are there for a reason, and allow your child to learn with a toy vehicle developed to suit their age group. Using a kid’s 4 wheelers can help a young child develop their motor skills, as well as build up their confidence as they realize they are capable of driving one on their own!